Henry D Hanson who was with relatives on visit to America, and Racine man perish. The following graphic story of the Titanic tragedy was told a Journal-News reporter by Mrs Jenny C Hansen: "the first intimation I had that something was wrong was when the engines stopped. We did not notice scarcely any jar when the ship struck the iceberg, but after being on board for several days one gets so used to the pounding of the gigantic engines that when they are stopped it is immediately noticeable. "We were in bed, but I rushed to the state-run door and said to Peter, something has happened, come on and get up right away, but Peter told me that it was something of no importance. I opened the door and asked someone, but they only told me to get back into bed. I went back, but I heard the steerage passengers coming upstairs and I looked out again. I saw the cabin stewards with lifebelts on and people rushing around. I asked again what's the trouble was and an officer yelled to me to get a life belt on and get out on deck. Then I told Peter and with Henry we jumped into our clothes and got belts on. "By this time I knew that something awful had happened and I heard shots fired, but whether they were too scare the panic-stricken steerage people or distress signals I could not tell. We got out on deck and as the stairs leading to the boat deck were crowded with passengers, we had to climb up on an iron ladder on the outside of the ship. "I stood there with Peter and Henry and when an officer told me to get into a lifeboat, I was willing but when they wouldn't let Peter go with me I just hung onto him and begged and begged them to let me stay too. An officer grabbed hold of me as I kissed Peter, and threw me into a lifeboat and I got an awful bump on the head that stunned me for a long while. There were 40 women in the little craft and it was crowded. As we were lowered to the water someone threw a baby over the deck, but instead of it going into the lifeboat it hit the water, and was drowned. Peter threw me my pony coat and I caught it all right. "Oh! Why didn't they let me die with Peter? I begged and begged to be allowed to stay with him, but an officer just threw into the lifeboat. I thought Peter had been saved to or I would have jumped into the ocean instead of going on board the Carpathia. As we called away from the sinking Titanic I could see Peter and Henry standing on the upper deck just where they were when we parted. It was the most pathetic site I ever hope to witness, as the boat broke into, with the people on board shouting and crying, while the band played "Nearer my God, to thee." "The night was the most beautiful of the whole trip. The sea was calm and the only bad feature was the cold, due to the fact that we were so near icebergs. We could see the ship sinking and sinking, and it was a fine site. The lights, every one on the ship, were burning until the explosion occurred, and I watched until I saw the last porthole go under. "We had difficulty in getting the lifeboat off the ship, owing to the fact that the Titanic had already split amidships. There were three oarsmen in the boat, but there was no food nor water nor blue light, three things every lifeboat is supposed to be equipped with. There was only one boat in the whole bunch that had bluelight and we were forced to burn Hank achieves and clothing all night so that any rescue ship might sight us. "It was 12:15 at night when we got into the boat and we had rowed a mile when the Titanic went all the way under. The sunrise was beyond description and it was daylight when we cited the Carpathia coming towards us. The Carpathia was forced to anchor 2 miles from where we were because of the icebergs and we had to row over to her. "It was 1215 when we got into the lifeboat and it was 715 in the morning when we were hoisted on board the Carpathia in a sort of swing. We were all so sorely frozen and dazed that they had to tie us into the swing. All the time we were in the lifeboat the best oarsman of the three sat on my lap it was so crowded. I was paralysed, but I was afraid to move for fear he would give out if you quit rowing we would have been lost. "I think I have gone through enough on this trip to make me death-proof, I remember well how I buckled on Peters and Henry's life belts and how, besides holding the oarsmen on my lap, I also held a little baby, his mother and father were lost, most the time we were in the lifeboat. "It was beautiful how we had to refuse to take drowning women and men into the boat, but we couldn't because it was so crowded. We would see them in the water, trying to swim and crying and begging, but they had to drown. "I did not see major but all Mr Astor on the Titanic, but I saw Mrs Astor and a lot of other notable people who were saved after we reached the Carpathia. We were all together and it was just like one big family party. "I think this man Ismay, owner of the White Star line, is a sneak of the worst kind. Why didn't he let some of the men who had families go in that lifeboat instead of himself? I did not see him on the Carpathia, for he stayed in his quarters all the time. "We did not know but what everybody was rescued until we reach New York, and I can't yet realise that Peter was drowned. They told us when we left the Titanic that the Carpathia and Olympic were near and would rescue everybody, though I was just as happy coming in as I ever was for I was sure I would be reunited to Peter just as soon as we reached New York. "When we got into port we were taken to hotels in the boat company gave us every care we could desire, but they would not let us read the newspapers. 10 or 12 people tried to see me at the hotel, but the women who run the junior league home would not let them see me. I don't know whether the company tried to bribe the passengers to keep its still about the thing or not. "But They were awfully good to me though. They took care of me all the time I was in New York and then bought me a first-class ticket all the way here and sent a nurse through to Chicago with me. We had everything we could wish for. "When we were leaving the Titanic I wanted Peter to come with me but he said, no you go ahead and maybe one of us will live to tell the story back home. Let the ladies go in the boats. If I went it would beat a lady out of a chance to live. I would not do that and you wouldn't want me to. How well I recall these words now. "It was awful in the lifeboats for we had to keep bailing out the water all the time we were in them. The exposure killed for and they were buried at sea from the Carpathia, but I was happy for I did not realise what had happened and not the person said a word all night. "I can't say what boat I was in, but I took the first one leaving after it reached about deck of the Titanic. Oh! Why didn't they let me die with him and let some of the men who had families go in the boats? If I had known Peter had not been saved I would have jumped overboard. "It was all excitement when we reached New York with the newspaper men taking flashlight after flashlight and everything was hustle and bustle. "People who had friends and relatives on the Titanic were rushing around trying to locate them, and I was awful glad to get to the hotel I doubt if I can ever look at water again. It is terrible for those immigrants who were rescued, whose husbands and fathers were lost. They are being sent back to the old country and it must be a dreadful trip for them after what has happened. "I haven't shed a tear yet for I can't realise what has happened. I still believe that Peter is safe and I can't get anything else into my head. He didn't seem a bit worried when he kissed me goodbye and watched me put into the boat by an officer. "I want to get home for I'm awfully tired of travelling and I will never leave again." Upon the arrival of Mrs Hanson here she was met at the train by a group of relatives and taken in an automobile to the home of her brother, Thomas Howard on Canter street, where she is today. Mrs Hanson is suffering from a fever today and no one except immediate members of her family are permitted to see her. It is feared that she will suffer a breakdown as soon as she realises that Mr Hansen and his brother were not saved. This morning Mrs Hanson however instructed her sister Mrs Bretherson and her brother Howard to make arrangements for the disposal of her brother in laws body providing the HD Hansen who's body was found is he as soon as it reaches New York. Terence racing jam news. 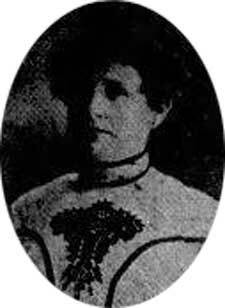 At 9:15 last night the Journal News received a telegram saying that Mrs Peter C Hansen would arrive here at 11:40 over the Northwestern Road. Two reporters and a lady attendant, the latter to care for Mrs Hanson, in case she was unaccompanied, were headed to Kenosha, where they boarded the train, and received Mrs Hanson's story. When Racine was reached the Journal-News and relatives had taxis waiting to hurry Mrs Hanson and relatives to the Howwood home. Mrs Hanson is prostrated at her brothers home today. "Words cannot thank the Journal-News and its employees for the service they have been to us during the long hours of expectancy. The way your paper has handled the story of the disaster and taken care of our requests for assistance in securing information cannot be praised too highly, said Thomas Howard, brother of Mrs Hanson, this morning. "My brother's words of thanks for me to the Journal News has been of great service to me said Mrs Chris Brotherson sister of Mrs Hanson.